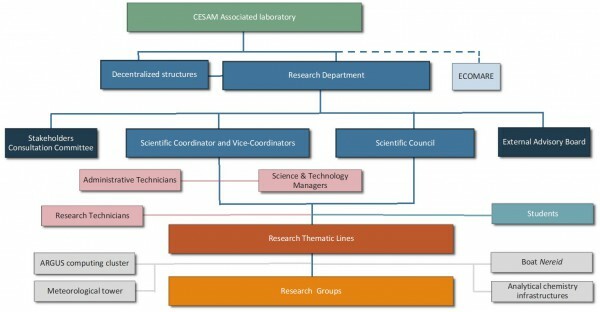 CESAM’s Scientific Coordinator (ScC) is supported by a team of 4 Vice-coordinators, with a balanced representation of CESAM research areas, which together with the former ScC (now an honorary ScC) the Principal Investigator (PI) of each research group (RG) and thematic line (TL), and the representative of the Post-Docs researchers form the CESAM’s Coordinating Commission. CESAM’s management structure and procedures can be divided into 3 levels of bottom-up management activities: Cross Management of RGs (e.g. ensuring internal and external communication, including through CESAM’s intra- and internet) Integrative TL Management (e.g. flag cross-cutting projects) Strategic Management (e.g. strategic objectives, implementation, management of resources). CESAM also relies on the advice and constructive criticism from the External Scientific Advisory Committee (SAC, established in 2005). Furthermore, to ensure the best practical use of CESAM’s research, fostering multi-actor approaches, a Stakeholder Consultation Committee (SCC) consisting of 10 people representing key local, regional and national bodies has now been established.